You know what we hate? When companies don’t list prices on their websites. We don’t want you to hate us, so, here’s a list of what you can expect to pay for our services. 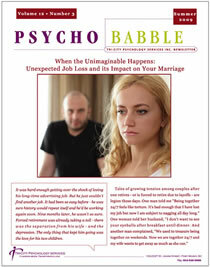 Our newsletter Psychobabble is dedicated to helping destigmatize emotional and mental health issues. It's part educational, and part motivation and guidance. Enter your email address to SUBSCRIBE ( We respect your privacy).